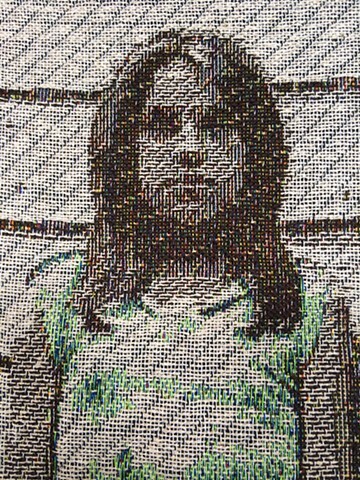 Sonya + Osanna is an image-based woven representation of an original photograph by American artist, William Gale Gedney. Gedney’s image, entitled, Two girls with dirty clothes holding hands (1964) is a black and white photograph of two (pre)pubescent girls of rural Kentucky. I selected this image to represent the two unnamed individuals from whom osteosarcoma cell types U-2 OS and SAOS-2 were biopsied. All that is known about these individuals is that they were 11 and 15 year-old, Caucasian females, and that tissue/cell samples were taken from them in 1973 and 1964, respectively. It is likely that they were tall girls, given the highest incidence of osteosarcoma in the shinbones of (pre)teen girls undergoing rapid growth spurts. It is not known or stated whether these individuals or their families gave consent to have their bodily materials sampled, cultured and grown for scientific purposes. The human names I have assigned each of these cell lines are based on my understanding of early cell-type naming practices, where a coded abbreviation of the donor’s name was used. In this case, the OS stands for osteo (bone) but I have fabricated girls’ names based on OS regardless. CMYK Jacquard weaving is an advanced, computerized loom weaving technique, where each pixel of an image corresponds to an independently controlled, coloured thread. The warp consists of 6 colours: red, yellow, blue, green, black and white. Through this technique, it is possible to render colour images as cloth structure (not just as surface treatment). In my design, colour structure has been added to the dresses of the girls, to highlight a gendered material code that signifies them, similarly to how Gedney titled his original photograph. Colour is expressed in the weaving through optical mixing, by designing complex structures that strategically raise or lower specific thread combinations while also maintaining the structural integrity of the cloth. In this way, Sonya and Osanna have been digitalized and (re)materialized. Silk and cotton yarns. Handwoven CMYK Jacquard cloth.